Fort Collins City Hall is located at 300 LaPorte Avenue, Fort Collins CO 80522; phone: 970-211-6500. Photo: Avery House, ca. 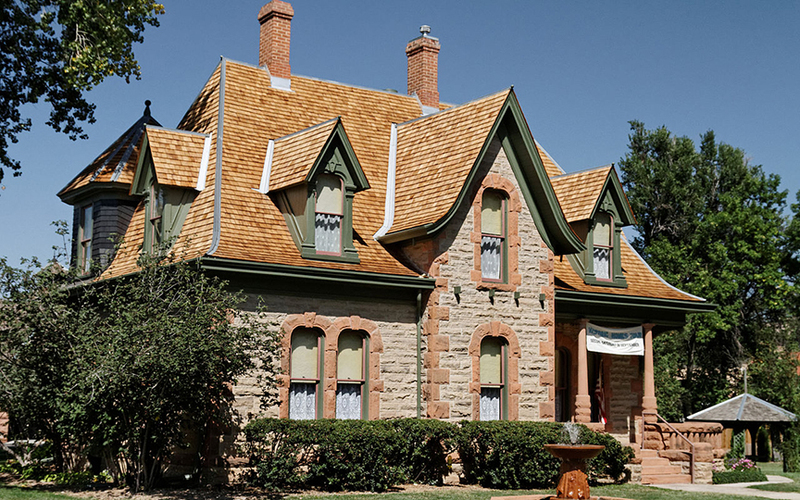 1879, 328 West Mountain Avenue, Fort Collins, CO. Listed on the National Register of Historic Places in 1977. Photographed by user:Gribeco (own work), 2012, [cc-by-3.0 (creativecommons.org/licenses/by/3.0)], via Wikimedia Commons, accessed December, 2013. Fort Collins had its beginning in 1862 as a military camp located on the Cache la Poudre River, near present day LaPorte. Established to protect emigrants and mail delivery along the Overland Trail from Indians and outlaws, the camp was forced to relocate to higher ground farther downstream following a flood in June 1864. The camp, named after regional commander Lieutenant Colonel William O. Collins, was renamed Fort Collins. The military establishment was short-lived, however. In 1867, the last soldiers were withdrawn, but the small group of settlers which had grown up around the post remained to form the foundation of a permanent community. Fort Collins' first streets were platted later that year, and in 1868 the young town was designated the Larimer County seat. Prior to the fort's establishment, settlement of the region had begun following the 1858-59 gold discoveries in what was soon to become Colorado Territory. Even earlier, traders and trappers had passed through and spent time along the banks of the Cache la Poudre River. Antoine Janis, who staked out a squatter's claim in 1844 on the Cache la Poudre near present day LaPorte, has long been regarded as among the earliest permanent Euro-American settlers in northern Colorado. Janis remained on his claim until 1878, supporting himself from the land by supplementing his trapping with some vegetable farming, and using water from the Cache la Poudre to irrigate his crops. Following the 1859 gold rush, increasing numbers of settlers moved northward and began to explore the area of the Cache la Poudre Valley. Men who failed to make a mining strike were soon forced to seek other means of support, and many turned to subsistence farming. As settlement spread from the gold camps at Denver and Aurora, the Cache la Poudre region soon gained favor for its agricultural potential. Fort Collins' beginnings as a military post and the June 1864 flood have been written about extensively over the years. A well written, concise account of these events is Agnes Wright Spring's "The Founding of Fort Collins, United States Military Post," The Colorado Magazine 10 (March 1933): 47-55. Ansel Watrous, History of Larimer County Colorado, (Fort Collins: The Courier Printing and Publishing Company, 1911), p. 40. † City of Fort Collins Planning Department, Agriculture in the Fort Collins Urban Growth Area: 1862-1994, 1995, www.fcgov.com, accessed July 2008.